Nature Iraq Foundation, together with Nature Iraq, plans to recreate a journey down the Tigris River, starting in southeastern Turkey and travelling through Iraq to the South, using traditional boats and vessels, like a tarada, a kalak and a guffa, in order to document and bring awareness to the myriad threats facing not only the timeless waters of the Tigris but also the unique cultural heritage of Mesopotamia. In so doing, the project seeks to connect conservation issues with daily life and enable people to take action. The Flotilla will start September 15 of 2013 and will take around two months. Achieve greater awareness in local communities in Turkey and Iraq about the threats to the Tigris River, and help call global attention to this one-of-a-kind ecology. We will do this through riverside community outreach and presentations, local media interviews, and through a blog that will catalogue and explain the journey to the greater global community. Collect data critical to understanding the ecology of the Tigris and document the state of the river through water quality tests and threat assessments. We will partner with at least one university in Iraq and one in Turkey for the analysis of the data to help encourage regional partnership on water protection. Create a stronger voice and network for communities to influence decision-making regarding water resource management by identifying at least 15 Community Waterkeeper Liasons, building a website for future networking, collecting declaration letters from communities on what they want for their local water source, and organizing at least 3 direct actions throughout the trip. During the Tigris River Flotilla we will be able to provide you with updates courtesy of Thuraya. 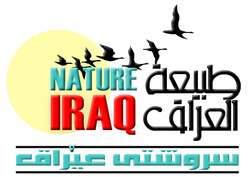 This leading mobile satellite communications company that empowers people with tools to bring the organizations and communities they serve closer together, has offered offered Nature Iraq a sponsorship of free internet air time. Thuraya offers innovative, flexible and dependable technology that helps you overcome the toughest challenges and achieve the highest aspirations - facilitating reliable communications where and when it matters most. Their global customers include industry leaders from a variety of sectors including energy, media, marine, government and NGOs. The Guffa is a cargo and passenger carrying boat. Guffas are not designed for speed nor sea-worthiness but facilitates the carrying of the greatest possible cargo with the most economical use of material. This is important because in some cases, particularly on the Tigris, the Guffa is abandoned after one long-river voyage. The construction is a frame with waterproof covering and is propelled with a paddle. The wooden sticks are of pomegranate and the only other materials are twine, straw and pitch. The Guffa is also interesting in that it has no waterproof skin as such, the pitch, which comes from Hit on the Euphrates, being laid on sufficiently liberally to act as a skin. The Mesopotamian Marshlands of southern Iraq are the home of the Ma'dan Marsh Arabs who have a direct ancestral link to the peoples of ancient Sumer. Their sheiks once travelled in this watery world in graceful, long (up to 8 to 10 meter) Tarada canoes. The Tarada is a bitumen-coatend reed canoe, with largeiron-bossed nails studding in its flanks. But as these wetlands have declined and shrunk in size so too have the Taradas disappeared from the reedbeds of the Mesopotamian marshlands. 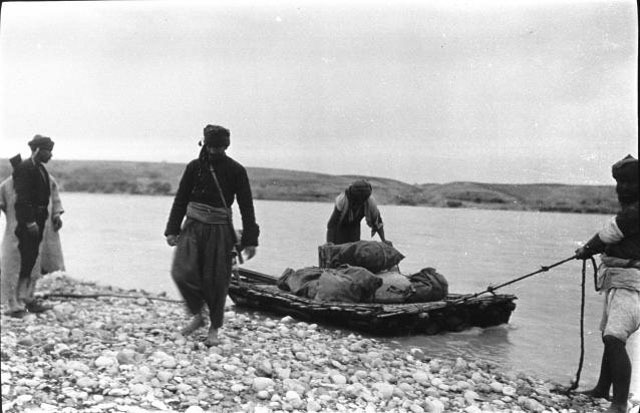 The Kalak is a traditional vessel used for downstream transportation on the Tigris. A raft is made of the strongest reed or wood that can be found and is supported by attaching inflated goat skins. Kalaks can carry loads of up to 35 tons, including men and donkeys, and can take as little as a few days to travel from Mosul to Baghdad. The loaded rafts float down the river with the current, and are particulary usefull in part of the rivers with rapids and shallows because, despite the loss of some skins, the rafts still keep afloat. The Kalak built for the Tigris River Flotilla will be made in Hasankeyf Turkey, using twelve goatskins.